My tempted man’s hand finally fell off. It had been manipulated quite a bit, so I was pretty much expecting that. Ordered 2 new ones, just in case. I want to try a different method for bending his arm this time and make it look a little more natural. Then I painted some small details just so I remember they’re there. Mostly the wood pieces. I’m going to get my airbrush fired up and do some painting on it so I don’t risk a dry brush on all the little pieces. I’m also considering some little fun stuff on the back just for visual interest. We’ll see how far I get. Right now it kind of looks like a hornets’ nest, but I like it!. There are 2 femurs at the bottom, and more to come. 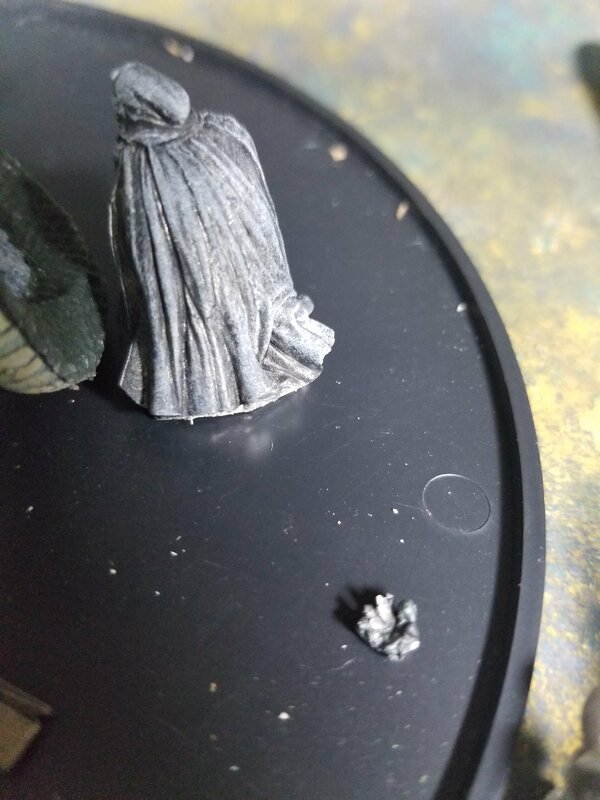 When the air dry clay hardened, it shrunk back a little. So I’m having to do some excavation to get her in there now. I may end up just building it up some more around her. We’ll see. 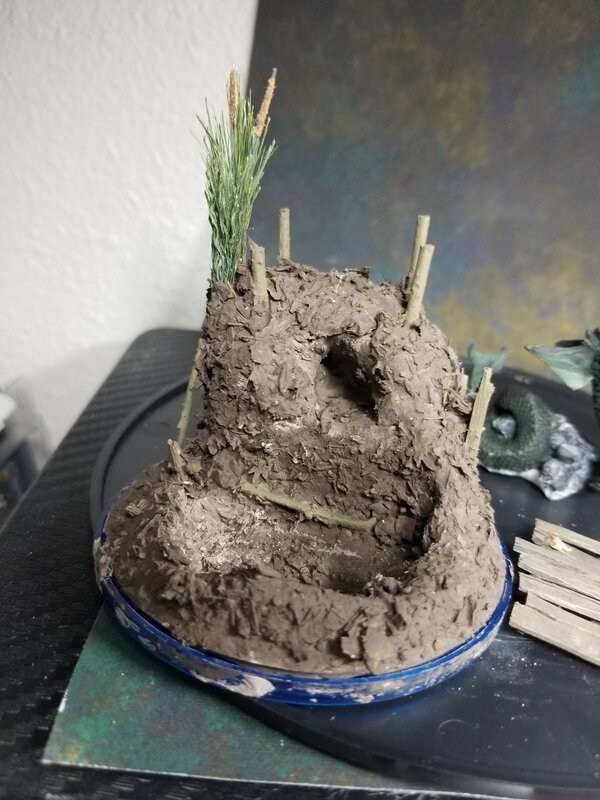 My goal for today is to make a mockup of this (just some air dry clay and my leftover mud mixture) and pour some resin on it and see how it does. My concerns are that it may have a lot of bubbles. 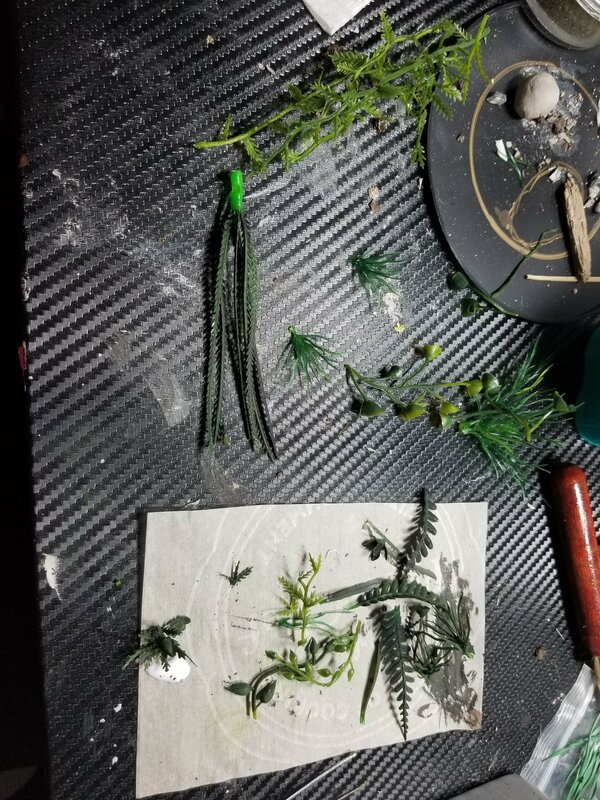 The other thing I need my airbrush for is to work some more on these aquarium plants. Brushing them is pretty tedious, and I think an airbrush would lend a softer touch. They’ll be clipped and added all over for a swampy feel. The one sitting next to the dot of glue is a kind of makeshift fern. So, that’s my new progress! Hope y’all are enjoying following along!